Update: An army of Kuka robots appear at the Tesla Fremont factory to ramp-up Model 3 production. So the day came at last where Elon Musk/Tesla confirmed that July is the month when the final production version of the Model 3 will be unveiled and presented to the world. The Tesla CEO was a on a tweet-storm today as well which always results in news and articles on the web-sphere. Tesla as a company has a lot on the plate from cars to solar, powerwall and battery packs and Model 3 is their biggest promise of the year. Reservation holders, Enthusiasts and media have their radars on high alert regarding Model 3 final unveiling. Let’s check the following chart for a vehicle delivery performance evaluation on Tesla Motors through the years what they have to deliver in 2017. 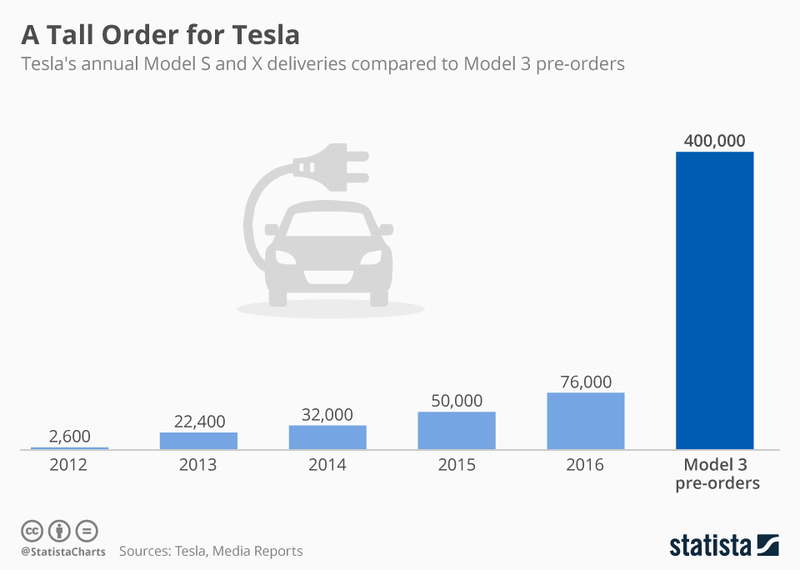 So if Tesla somehow doubles their production and delivery (very unlikely to happen) and dedicate half of their resources on Model 3 deliveries, the math says they’ll only be able to delivery 30-40 thousand Model 3 cars max in 2017. So some people might have to wait 2-3 years for their Model 3 to be delivered if they decide to order it after seeing and testing the final product. However before the final unveil we are seeing several spy shots every other day or so which gives us an idea of the final product. Until the finale unveil enjoy the following Model 3 video in HD !